VPN Tracker is designed for professional use by businesses and IT consultants. It supports industry standard VPN protocols and is compatible with all major VPN brands and gateways. In addition to IPsec and PPTP, it supports vendor-specific VPN protcols for automatic configuration and authentication, making it easy to get set up. VPN Tracker Company Connect includes device profiles for 300+ VPN gateways by leading manufacturers. Learn more. 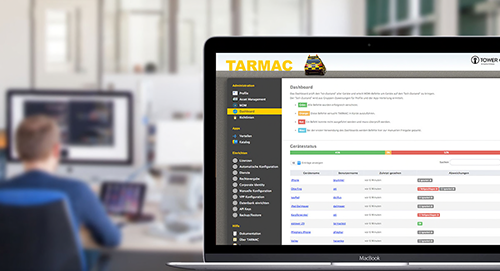 TARMAC 2 lays the groundwork for an entirely new field in the area of MDM – Mobile Productivity Management (MPM). With MPM, TOWER ONE has shifted focus to productivity and collaborative working in companies. The new Briefing Center app enables companies to work seamlessly and securely with iPhones and iPads: Wi-Fi, mail, calendar, VPN, and more, are automatically configured personally for every employee. Learn more. EquinuxWorks.com is a division of Virtual Graffiti Inc, an authorized Equinux reseller.